The difference between standard acrylic and Daikan Hard Acrylic surfaces is very obvious when scratching. With its scratch-proof qualities, our acrylic is suitable for sign plates or cases requiring frequent cleaning. * Please note that the cut and engraved surfaces of Daikan Hard Acrylic will be the same hardness as standard acrylic (Approx. 2H). *Thermal Cycling Test held in 10 sets of -35℃*6hours and 72℃*3hours. Numerical values above are not guaranteed, representative only. Design data to be provided in Adobe Illustrator® format. 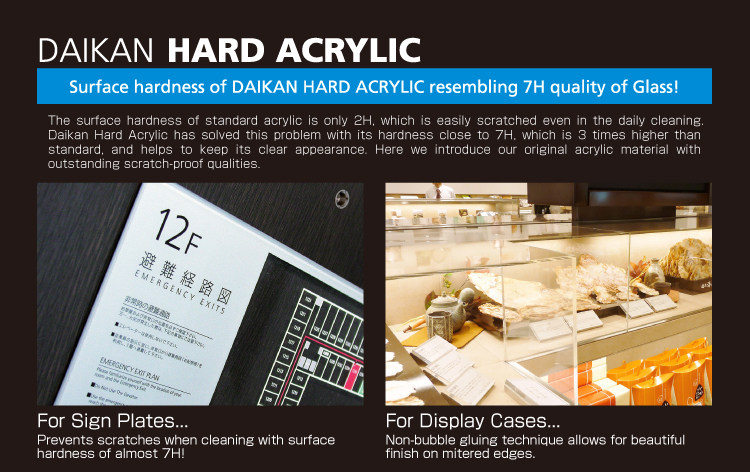 * Orders for Daikan Hard Acrylic material only are not accepted. Products made with Crystal Engraving, Crystal Cut or DPS etc. are available for both single-unit and multiple-unit orders. * Bending and plane-surface bonding qualities of standard acrylic are not applicable to Daikan Hard Acrylic.